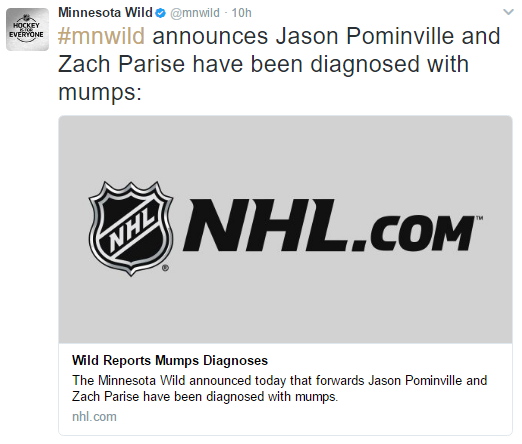 Just days after the Vancouver Canucks announced confirmed and suspected mumps among several players, officials with the Minnesota Wild hockey team reported that forwards Jason Pominville and Zach Parise have been diagnosed with mumps. Members of the organization that have symptoms are being tested immediately and placed in isolation for a five-day period. Team doctors recently provided players and staff an MMR vaccination and the organization will continue to work closely with the NHL, NHLPA and the Minnesota Department of Health to help prevent further infection. According to the Centers for Disease Control and Prevention (CDC), Mumps is a viral illness that is transmitted by direct contact with respiratory droplets or saliva from an infected person. It is best known for painful, swollen salivary glands that show up as puffy cheeks and swollen jaw. Males may also have painful, swollen testicles. Other symptoms include fever, headache, muscles aches, tiredness, and loss of appetite. The MMR vaccine is safe and effective, although not 100 percent effective. According to the CDC, two doses of mumps vaccine are 88% (range 66% to 95%) effective at preventing the disease; one dose is 78% range (49% to 91%) effective. In addition to vaccination, other preventive measures that can be taken to prevent the disease include: Do not share food, drinks, utensils or other personal items that may contain saliva; wash your hands frequently with soap and water, or use an alcohol-based hand rub if soap and water are not available; cover your nose and mouth with a tissue if you sneeze or cough, and discard the tissue after you use it. If a tissue is not available, sneeze or cough into your upper sleeve or elbow, not your hands; clean and disinfect objects and surfaces that may be contaminated with germs and people with the mumps should stay home, and away from public places for five days after the onset of symptoms and limit contact with others in their household.